"I live in Menorca with my Menorcan husband. 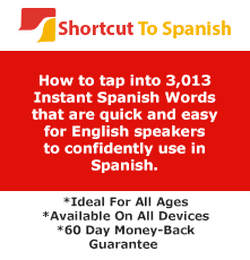 I have been here for 6 years and have always had difficulty in creating Spanish sentences. Your course has helped me to understand the language and I now have more confidence when speaking to my husband’s family." "After spending hundreds of pounds / dollars on other methods of learning Spanish, ie Traditional Language courses, books, even expensive private tutoring, I have found that the methods you use yield far greater, and more importantly, lasting, memorable results."